Caption slip reads: "Photographer: Glickman. Date 1957-07-19. Assignment: Liberace mom beaten. 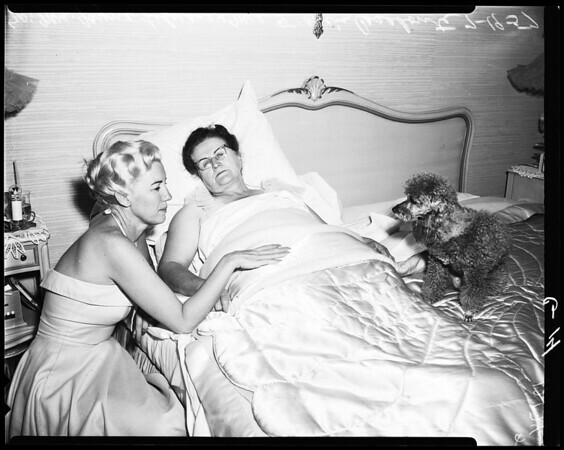 4 shots: Frances Liberace Casadonte - 65 - lies in bed, as daughterinlaw Mrs. Jayne Liberace, 'Georges,' wife sits besides her. Jaynes also hands her sip of water. 1: Mrs. Casadonte alone. (dark haired). 1: Mrs. Ann Farrell, and Mrs. Casadonte. Mrs. Farrell is her daughter."